It is the user's responsibility to gain adequate instruction in the use of all climbing equipment. Professional training is recommended. In order to help the user attain a basic understanding of the skills and knots required to use these kits, we include a free copy of The Tree Climber’s Companion with every starter kit but this is not intended to be the sole source of instruction. Spur climbing damages trees. Climbing with spurs damages trees. Spurs are most often used for removals. Rope climbing kits are available for non-harmful climbing. WesSpur Combo Spur & Rope Climbing Starter Kits contain everything necessary to spur and rope climb a tree in one price-saving package, without duplicating gear. Compare our kits to those offered by others, and you will find the gear quality and savings in a WesSpur kit to be much higher. Every combo spur & rope tree climbing kit contains all the tree gear needed to cover the basics, the best beginner's guide to tree climbing, and a substantial discount. The best entry-level Combo climbing kit for working climbers! This kit combines the Entry-Level Spur Kit with the Entry-Level Rope Climbing Kit, providing quality equipment to cover the basic needs of an entry-level climber. With this package you will have the essential gear to enter a tree on spurs and flipline or in a moving rope system, and get to work. Just add saws & safety gear! For rope climbing, this set includes 150’ of 1/2” Arbor-Plex rope, a 9mm Eye and Eye RIT Prusik, and a micro pulley for prusik tending. For spurs, you get Buckingham Spurs and Weaver Shin Cup pads, which have angled steel inserts that provide rigid support and superior comfort when compared to soft pads. The split-suspension harness is both durable and comfortable, featuring a wide padded back and a leather-lined sit sling. Store and transport your gear in the canvas gear bag. The Tree Climber’s Companion is a great guide for beginners. Video Overview by Niceguydave, and WesSpur 2018 Climbing Kit Update. The perfect kit for professionals who spend a lot of time in the canopy and in spurs, with great harness options and top-quality gear. The Deluxe kit offers three different high-performance saddle options. The Viking is a great all-around workhorse; it’s uncluttered, well-padded, with a replaceable ‘Warp Speed’ rope-bridge. The Spartan is modeled after the Buckingham Ergovation, and is a heavy-duty, super comfortable saddle that provides support for spurring while also relieving pressure on the hips and lower-back. The Petzl Sequoia is lightweight, sleek, and low-profile, with a sewn rope bridge and quick-snaps on legs and belt. Includes gear bag, rope bag, and throw line cube to easily store and deploy your gear. WesSpur's Premium Combo Spur & Rope Climbing Kit Now with SAKA Mini! This kit combines the Premium Spur Climbing Kit with the Premium Rope Climbing Kit to provide the ultimate set of professional tools for the serious climber. Most customers customize this kit - you are free to upgrade or swap out harness, pads, ropes etc., and keep the kit discount! Every component of this kit is top-of-the-line for comfort, construction, and usability. Lightweight, comfortable climbing gear built for the professional user. With the Premium Combo Kit, you get both a super-comfortable, lightweight spur climbing setup, and gear to enter the tree in a super-efficient ropewalker system and work the tree in SRS or MRS. The Petzl Transport bag and Eclipse storage system will store all of your rope-climbing gear, and the WesSpur Spur Bag will stow your spur climbing set up safely. 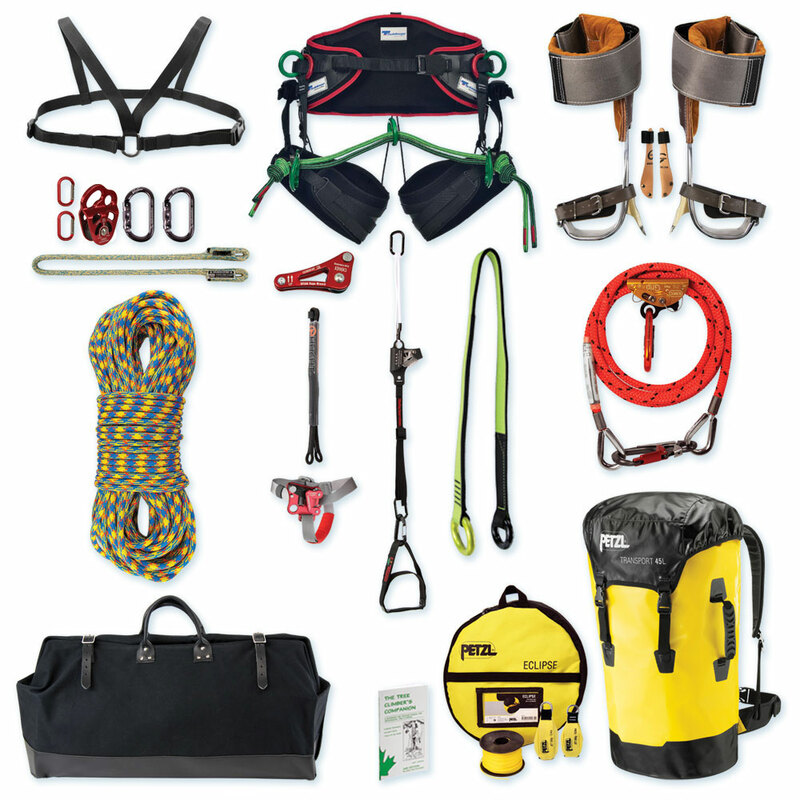 This kit sets up a professional climber with top of the line gear to start a career, with a nice discount to get you started.